Speakers David Talbot and Hector Tobar discuss their experiences working in media and where they think it is headed. Photo by Daniel Green. Two UC Santa Cruz alumni recently spoke about being involved in two media worlds: a mainstream and a progressive, a digital and a print, a formulaic and a free. In “Transforming Medi(a)ocrity,” an event held on April 12 sponsored by UCSC’s SOAR/Student Media/Cultural Arts and Diversity center, students, members of student media and faculty had the opportunity to discuss ongoing and contemporary media issues with alumni Héctor Tobar and David Talbot. 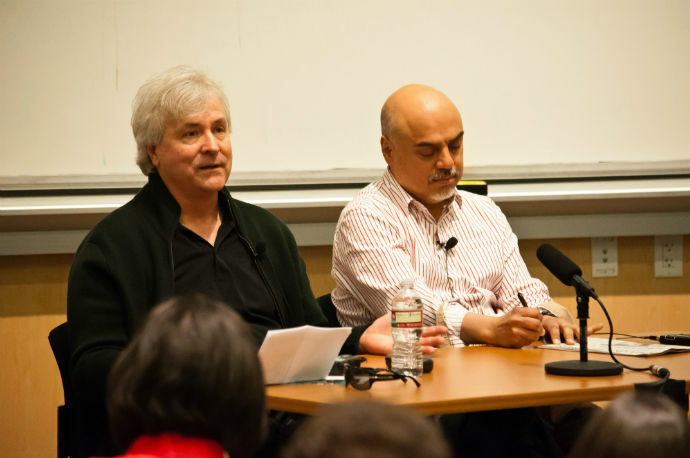 David Talbot and Héctor Tobar both wrote for local publications while attending UCSC — TWANAS for Tobar and an underground paper for Talbot — and went on to do groundbreaking work in the media. As founder of Salon.com, Talbot stressed the need for more than “one-dimensional” media and invoked UCSC students’ ability to rethink what’s possible. Tobar, a Pulitzer Prize winning columnist for the Los Angeles Times, said that no pressure — to meet a deadline, to appeal to the online community’s hyper-short attention span, to tell the story people want to hear — can compare to the voice inside that urges media makers to get the story that resonates beyond pomp and circumstance. The atmosphere was focused, the discussion fruitful.